Scott Zucknick is currently touring with the following equipment: Slingerland, Drum Workshop, Gretsch, Mapex, and Ludwig Drums, Paiste Cymbals, Gibraltar, Tama, DW/Pacific, and Yamaha Hardware/Pedals and Accessories, Remo Drumheads, Promark Drumsticks, Roc N Soc drum seats, SledgePad products Made in the USA, Future Sonics in-Ear Monitors, Mic-Eze microphone and camera mounting devices Made in the USA, Booty Shaker TnR products Made in the USA, AKG and Shure Microphones, May Internal Drum Miking Systems, Alesis, Behringer, ButtKicker Low Frequency Audio Transducer and Accessories, Switchcraft Jacks and Plugs, Anvil Road Cases, and Humes and Burg Cases and Bags. Drum Set 1: 2005 Gretsch Catalina Club Jazz in Silver Sparkle(the wrap has actually turned to a vintage gold color now) w/Wood Hoops(18x16, 8x12, 14x14), Gibraltar 8600 Flat-Based Hardware, Gibraltar Prowler Series Single Bass Drum Pedal, Remo Heads, Paiste Cymbals. Drum Set 2: 2000 Drum Workshop(DW)Workshop Series in Hunter Green to Black Fade(22x18, 10x8, 12x9, 14x11, 16x13), DW, Pacific, Tama, Yamaha, and Gibraltar Hardware and Pedals, Remo Heads. Cymbals: Paiste Alpha Series- 18" Thin and Medium Crashes, 22" Rock Ride, 14" Sound Edge Hi-Hats, 18" Medium Swiss Crash, Paiste Signature Series- 14" Medium Hi-Hats, 20" Full Ride. Snares: 2000 DW Collectors Series Finish Ply(14x7) in Ultra White Oyster, 2006 DW Collectors Series Finish Ply(14x5) in Black Velvet, 1970 Vintage Ludwig Supraphonic(14x5), 1978 Vintage Ludwig Supraphonic(6.5x14), 1976 Vintage Ludwig Acrolite(14x5), 2012 Gretsch Mahogany(12x6) in Gold Foil, 2005 Gretsch Mahogany(14x5) in Silver Sparkle, Mapex Piccolo(13x3) in Chrome. 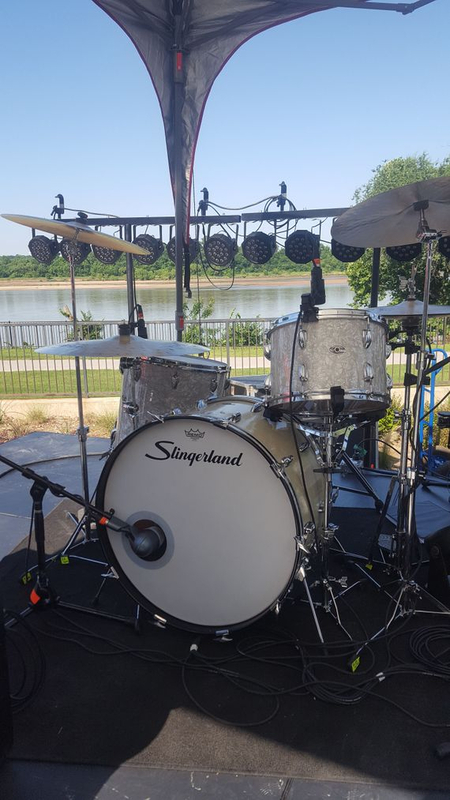 Drum Set 3: 1970's Vintage Slingerland in White Marine Pearl(24x14, 13x9, 16x16), Gibraltar 8600 Flat-Based Hardware, Slingerland Single Bass Drum Pedal, Remo Heads.